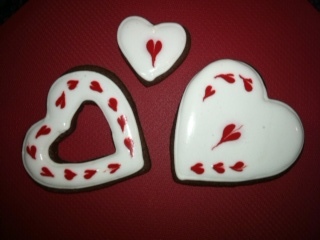 I'm on a quest to find a great chocolate sugar cookie recipe for decorating.... So I'm looking for a not-too-sweet recipe with good flavor that holds its shape and is strong enough to withstand the handling involved in decorating, packaging and transport. Here's my first (and possibly last if all goes well) shot... Joy of Baking's tested recipes are usually a good place to start. I mean, they've already tested the recipe right? Plus, they've been around for like a million years so, you know. It's kind of like asking your grandma... But, like with any recipe, the reviews can throw you off a bit and make you wonder if everyone actually made the same recipe? I chose The Joy of Baking's Chocolate Sugar Cookie recipe (a link to the recipe and their entire directions is at the bottom of this post). Simple, straight forward, easy ingredients. So far, I'm very pleased with this cookie recipe. It baked really nicely and held it's shape. 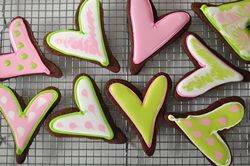 The flavor is not too sweet, so when you add the icing it's a perfect marriage. The final verdict won't be in until I've had some outside taste testing done... any volunteers? I did not have Dutch processed cocoa powder and decided to go ahead and use the regular, non-Dutch processed cocoa... I did some research and compared this with other recipes and it didn't seem like that much of a risk... Plus, it's really cold here today and I really wasn't up for a trip to the grocery store just for Dutch processed cocoa! I combined all the dry ingredients and did not alter any of the quantities. I creamed the butter and sugar then added the eggs. I prefer not to beat these ingredients too much as my experience has been that the more air you incorporate, the more spread you'll have with the cookie. I don't want these cookies to spread, so I just mixed in my Kitchenaid (with the paddle attachment) until well combined. I added my mixture of dry ingredients and mixed just until all ingredients were well incorporated. I wrapped the dough in plastic wrap and chilled for about an hour. The dough rolled out nicely. I rolled it not-too-thin (1/4 inch or more), so as to ensure a sturdy cookie and one that wasn't too crisp (aka, breakable!). I baked them for about 8-9 minutes at 350 degrees. Beautiful! They look like porcelain!